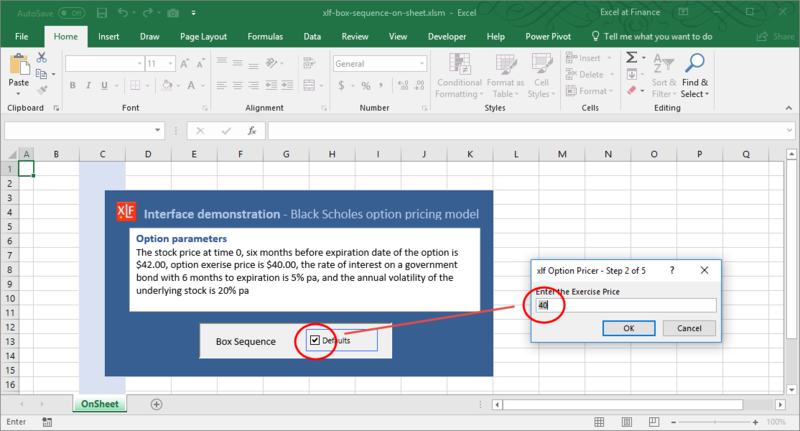 This module provides the VBA code for the Box Sequence control and links to the BS option pricing model. You can download the file from the link at the end of the module. MsgBox "Enter a Positive Value for the Stock Price"
MsgBox "Enter a Positive Value for the Exercise Price"
MsgBox "Enter a Positive Value for the Risk Free rate"
MsgBox "Enter a Positive Value for the Stock volatility"
MsgBox "Enter a Positive Value for the Time to Expiration. Year as a decimal"
& "xlf Input Box demonstrator", , "  Financial modeling | excelatfinance.com"